During the 61st Grammy Awards on Sunday night, we got a first glimpse of Pavarotti, the forthcoming documentary giving new insight into the legendary opera singer, helmed by Oscar-winning director Ron Howard (Frost/Nixon and uh, Willow, anyone?). 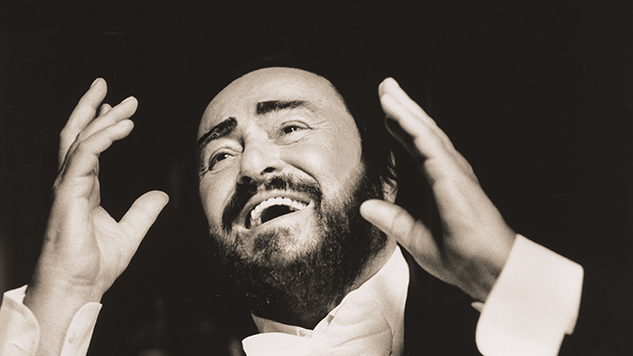 The film promises a deep look at Luciano Pavarotti’s life, constructed from his performances and exclusive footage. The first clip itself is short, yet still manages to slip in a Bono appearance during its 20-second run time (not the most random cameo when you take into their account his collaboration with Brian Eno and the Italian tenor on the single “Miss Sarajevo,” but odd nonetheless). The documentary boasts behind-the-scenes talent familiar with giving audiences an intimate understanding of music icons. Mark Monroe (The Beatles: Eight Days A Week – The Touring Years) wrote Pavarotti and Paul Crowder (Amazing Journey: The Story of The Who, The Beatles: Eight Days A Week – The Touring Years) edited the film. Howard shares producing duties with Grammy winner Nigel Sinclair, Oscar winner Brian Grazer, Michael Rosenberg and Jeanne Elfant Festa. David Blackman, Nicholas Ferrall and Dickon Stainer are executive producers. Pavarotti comes to theaters on June 7. Check out the first look at the documentary below.